Colorado River, USA: Today, Save The Colorado protested the Green River Pipeline Boondoggle. 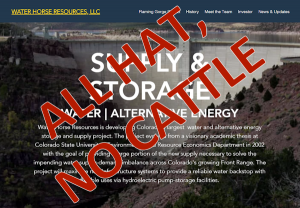 The proposal, by Water Horse Resources LLC, is to divert a new 55,000 acre feet of water out of the Green River and pipe it over to the sprawling Front Range of Colorado. The applicant is asking the State of Utah Division of Water Rights for a water right to divert the water out of Utah and into Colorado. Save The Colorado’s protest letter is here.